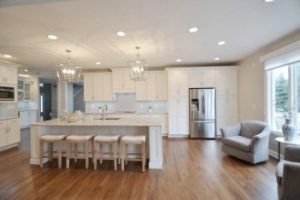 When it comes to re-designing a space, the style is typically determined by the homeowner’s tastes and the overall feel of the home. Oftentimes, consumers become intimidated by the overwhelming number of ideas and possibilities available and have a hard time deciding on the look they are wanting in their space. We have developed an interactive survey to try to help simplify these options and to help you find the perfect style for your home. Rustic Luxe – This style focuses on warm and rich tones. 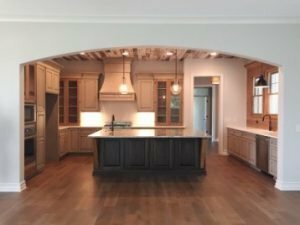 Natural stained cabinetry paired with hardwood flooring, granite countertops, and deeper-toned finishes help bring the outdoors inside, while still allowing for a feeling of luxury and sophistication. 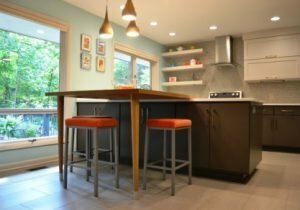 Eclectic Bungalow – Known to be a little more artsy, an eclectic style strategically combines a variety of different looks into one cohesive design. Multiple different finishes are often used in eclectic design. 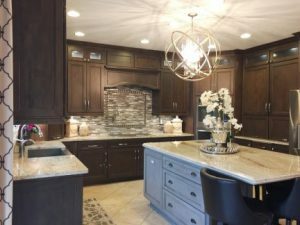 Two-toned cabinetry and/or countertops can be used in the space, along with both ornate and simplistic accessories to create a unique look. Downtown – Glitzy and Glamourous, the downtown style dresses up any space with bold, but simple, architectural details and sparkling accessories. 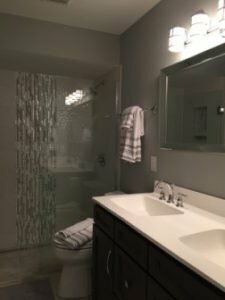 Acrylic cabinetry, waterfall countertop edges, art-like furniture, & statement-piece chandeliers are all characteristics of a downtown design. Sharp Contrast – Bold colors and materials are what draw homeowners to this style. Contrasting whites with blacks and charcoals or smooth finishes with textures finishes create a playful, but striking design. Uptown Classic – A timeless style with a flare is what sets this style apart from all of the others. Pairing neutral tones with a sparkling focal point gives the space a comfortable but stylish feel. 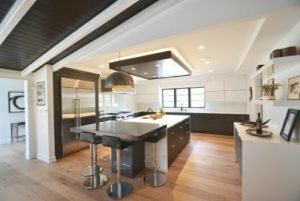 A dramatic metal hood or decorative lighting above an island can add an elegant touch to an otherwise standard white kitchen, creating an invitingly classical look. Country Cottage – Homey and inviting are the best ways to describe this design. 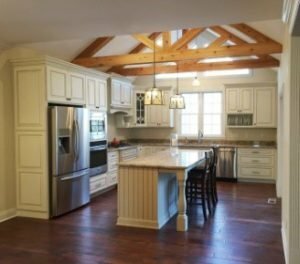 Considered to be fairly traditional, country cottages are often known for warm muted color palettes, lantern style lighting, & beadboard paneling. 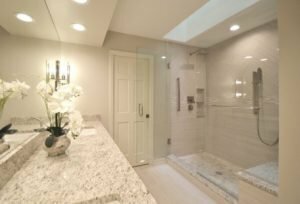 The Retreat – Oftentimes desired in bathrooms, homeowners are seeking a design that feels spa-like. Typically this is accomplished through monochromatic finishes, mostly using rich warm tones and a minimalistic approach to the design. Industrial Vibes – This style is typically achieved through the finishes selected for the space. Metals, exposed brick, concrete, & natural woods are all popular choices when creating an industrial space. 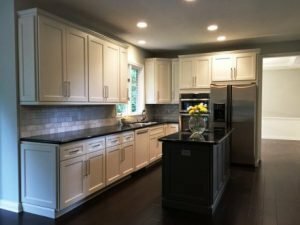 Shades of Gray – One of the most requested looks in today’s market, homeowners are asking for a color palette consisting of a variety of grays. It appears that gray is the new beige. This is a trend we don’t see going out of style any time soon. The neutral tone can pair with virtually every color and keeps the space feeling bright & current. Timeless Tones – For those that haven’t jumped on the “ultra-modern gray bandwagon” or have an older home with more traditional characteristics, a neutral taupe color palette could be a more suitable option. Using taupes & greiges (yes, that’s a combination of gray and beige), can achieve an updated look without compromising the homes rather traditional style. 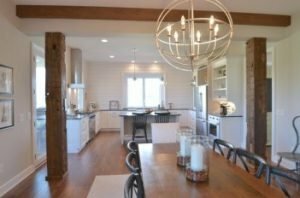 While we have created 10 categories of design to help launch the design process and hopefully simply the options available, homeowners are certainly not tide-down to just one of these styles. Oftentimes our designers mix and match these styles to find the perfect fit for each client’s home. Click here to take our survey today and talk to one of our designers about re-designing your home. For more information, contact us at 317.575.9540.